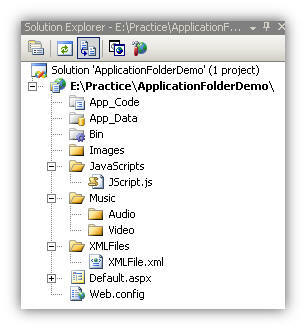 ASP.NET 2.0 uses a file-based approach. That means, all class files, resource files, data files and folders are maintained in a hierarchical structure. If we are working with ASP.NET 2.0, we can add files and folders using the Add Items option. If we look at a sample application hierarchy, it will look like the following figure. We can add as many as files and folders as we like (according to our requirements) within our solutions,and it won't be necessary to recompile them each and every time they are added. It is ASP.NET'stask to dynamically compile them when required. So, what ASP.NET 2.0 does is, it uses a predefined folder structure containing the files (classes, images, resources, etc. ), to compile them dynamically and we can access those files throughout the application. ASP.NET also provides special folders to maintain files and resources. Let's see the advantages of using these folders.